Student Body President Gerry Alexandre ’19 announced his plans to facilitate a campus-wide game called the Niche-Shattering Initiative, NSI for short, at a school meeting earlier this month. The goal of the game is to encourage students on campus to learn how to recognize everyone on campus, and to reach out to new people in doing so. 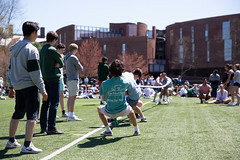 The game is a competition, where each of two contestants tries to name as many other Deerfield students as possible. Students’ DAinfo pictures are projected on a screen, and the contestants have to identify as many of their peers’ pictures as they can in 60 seconds. Whoever is able to name the most students in the allotted time wins. If executed properly, preparing for the game should cause students to get out of their comfort zones and meet new people. This would, of course, allow them to recognize more people in the game, but beyond that, help them develop friendships with new people that they might not have met otherwise. The game consists of two types of showdowns, friendly and official, each taking less than seven minutes. Friendly showdowns involve two students playing against each other, while official showdowns involve two contestants competing with a mediator to award points. The official showdowns are tracked in a tournament-style bracket. Alexandre personally seeded students by hall and day student groups, so the first round of the tournament will exist within the dorms. 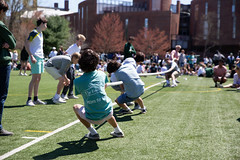 The tournament will then narrow by winners until there is a school champion. The game will end with Alexandre challenging the final community champion. Alexandre’s hopes are that this game will be another way to bring the Deerfield community together. He says that one of the main goals of NSI is to make people more inclined to get to know someone, before they make judgments about them. While explaining the process of creating the game, Alexandre said, “I started thinking about it in August, and talked about it with my family over Thanksgiving break. They gave me a lot of ideas, so I got really excited and wrote them down.” Soon, he had compiled all of his ideas and asked several Deerfield students for help, under the condition that it was kept confidential. Still, the initiative was far from complete. Next, the game had to pass through the administration for approval. 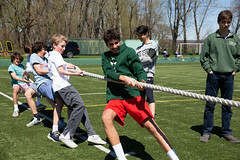 He set up meetings with Head of School Margarita Curtis and attended bi-weekly dean meetings, and, with guidance from these teachers and administrators, the original plan was altered and improved until it was ready to be announced. The official announcement of this game prompted excitement about getting to know the community a little better. 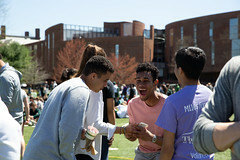 “I think it’s a great way to try and meet new people, since I know that, at Deerfield, people like to stay in their range of friends,” said Jasmine Decossard ’22. However, while many agreed it will help them meet people outside of their usual circle, some suggested that there might be a better way for people to reach out. Despite some hesitation from the community, Alexandre has high hopes for the tournaments success. He is optimistic that NSI will be able to make a positive impact on campus. Alexandre plans for the tournament to begin January 28th, and continue through the winter.